Meet The Shannons: It's too hot in NYC to bake, so let's talk about what's cool. It's too hot in NYC to bake, so let's talk about what's cool. 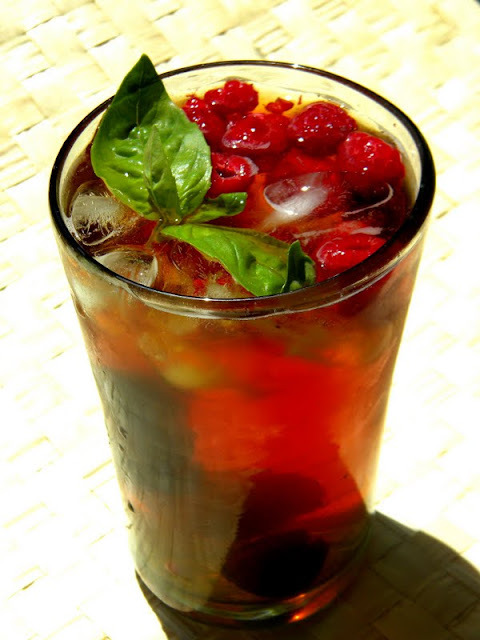 Earl Grey Iced Tea with Raspberries, Cherries and Fresh Basil - Sound Weird BUT So Good! So we bought a bunch of stuff to bake a ton of pies* just in time for a heat wave to hit NYC and drive me out of the kitchen. For someone like me, who spends about 80% of her life trying to be the prefect temperature but feels weird abusing air conditioning this early in the summer, this has been tough for me because I love baking and cooking. I've been conflicted, but ultimately being vegan and making food is about fun for me. Cooking in the heat isn't fun. So this post is all about avoiding suffering this summer. Yes, there will be lots of pictures in this post, and lots of pies coming up soon. I'm going to start with one of my favorite summer treats: Iced Tea! I know you're like, "iced tea isn't really a treat." But trust me... it can be! By using green tea or Earl Grey, you can add a new twist to this drink that's usually made with old-school black tea. You can toss in some frozen berries or sliced peaches, and experiment with fresh mint and basil leaves to add a sweet and fresh flavor your drink. We even got this cute little tray that makes fish-shaped ice cubes at IKEA for like a dollar to add a little fun. Before the summer is over though, we're investing in some spaceships. I love iced tea and couldn't make it through the day - let alone the summer - without it. But we know what you really want... FROZEN TREATS! The Mint Cookie & "Butterfinger" Vegan Shakes at Foodswings in Brooklyn - it's OK to GASP. We did. The best thing about heat waves is having an excuse to indulge in some frozen treats! 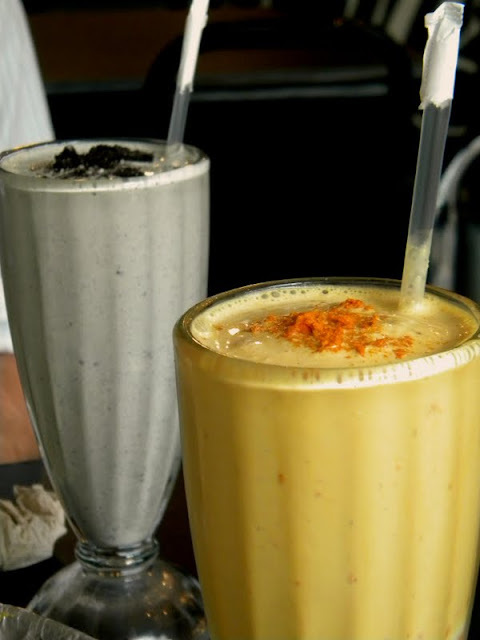 We've been lucky enough to move to a city with some of the best vegan ice cream spots in the country, but even if you're at home, you can make a shake using this recipe, or pick up soy or coconut ice cream at most grocery stores. There are also usually dairy/egg/glutton/lactose free options at many local frozen yogurt or ice cream parlors, probably more for folks with allergies than for vegans... but who cares? Vegan is vegan. 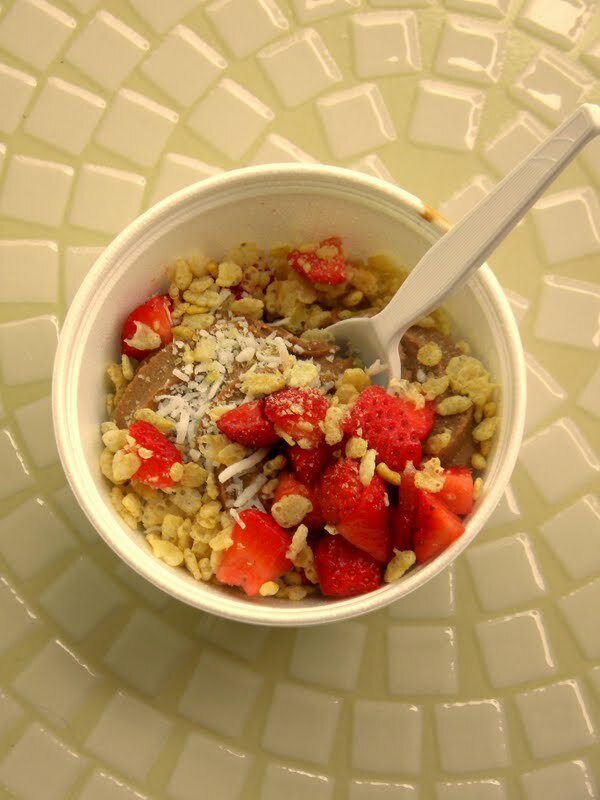 When we lived in Norfolk, we used to go to the local frozen yogurt parlor The Skinny Dip so much I had a "usual". 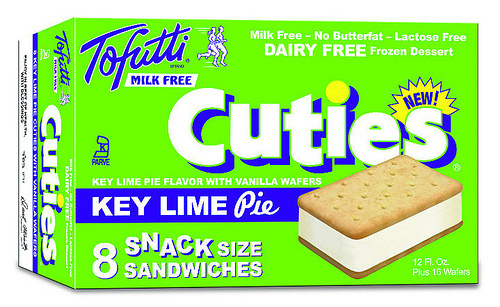 But let's be honest: it's not summer unless you have some Tofutti Cuties in your freezer. There might be a generational thing here when it comes to vegans. These days there are a lot of vegan frozen treats to choose from, but once upon a time the Tofutti Cutie was the one and only. Bless you sweet little buddies! You're welcome in my home anytime! On a serious note: if you're looking for a way to really avoid suffering, I recommend you check out Erik Marcus' Ultimate VeganGuide. I met Erik a few years ago at a VegFest and we had a long, great conversation on how similar and horrific factory farming for food and fur were. I was working on an anti-fur campaign at the time, and found it to be a really refreshing conversation about how the choices we make about what we wear can be just as important as what we eat, and about the role compassion can play in activism. Many of you probably already know Eric from his site Vegan.com. You can get the Kindle version of Erik's new book for only 99 cents right now! Why such a great deal? Erik just wants to help more people learn how easy it is to be vegan. The guide has tips and reflections from Erik's +20 years as a vegan and is great for anyone thinking about going vegan or has been vegan for years. How cool is that? *Not literally a ton because we don't have the counter space. Lula's Sweet Apothecary is amazing; I was in New York this past week and it was a must-visit for me! Their ice cream is so delicious and they're great about letting you try samples! Also wanted to point out that Erik spells his first name with a "k", not a "c"! Thanks Katherine! We made the change. aaaaaaaaaaaah why did i torture myself by clicking on this. i want that sundae SO BAD. Sorry to torture you but it had to be done. Mmmm, cherry iced tea is such a good sounding idea. I like to make iced tea with rooibos tea and add apple juice to it. 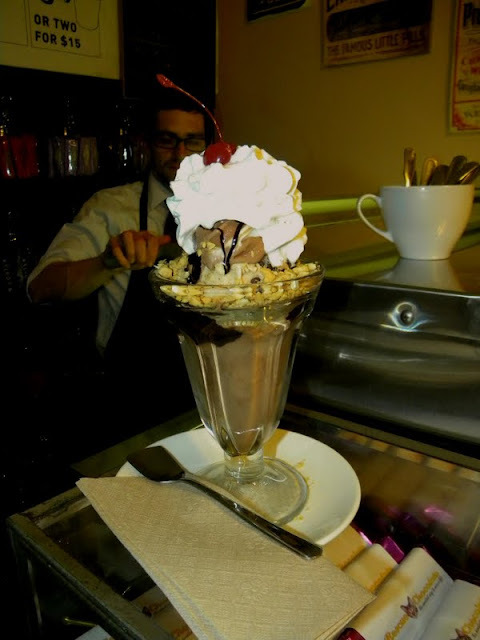 Do my eyes deceive me or was that Lula's sundae actually soft-serve twist?